Cartridge Care Manchester Supply Cheap Toner Cartridges To Businesses & Individuals in Greater Manchester. 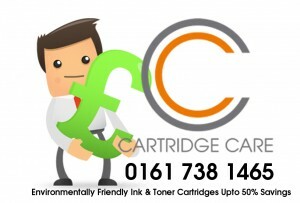 Call Us Today To See How Much You Can Save On Your Toner Cartridges Manchester – 0161 738 1465. Cartridge Care Manchester supply toner cartridges to businesses and households in Greater Manchester and the rest of the UK. We offer a free same day delivery service in Greater Manchester if the cartridge is in stock and you ring in the before 12 midday. On occasions that we don’t have the cartridge in stock we can supply the cartridge next day delivery. To place an order you just need to ring 0161 738 1465 and speak to our sales team about your printer cartridge type and they can give you a price there and then and let you know about any cost savings you are making compared to buying an OEM cartridge. Brother Toner Cartridges Manchester, Canon Toner Cartridges, Manchester, Dell Toner Cartridges Manchester, Epson Toner Cartridges Manchester, HP Toner Cartridges Manchester. Kyocera Toner Cartridges Manchester, Lexmark Toner Cartridges Manchester, Oki Toner Cartridges Manchester, Samsung Toner Cartridges Manchester, Utax Toner Cartridges Manchester, Xerox Toner Cartridges Manchester, Hewlett Packard Toner Cartridges Manchester. This entry was tagged best compatible ink cartridges Manchester, best compatible ink cartridges UK, Best Compatible Toner Cartridges Manchester, Best Place To Buy Ink Cartridges Manchester, Brother Printer Cartridges Manchester, Brother Toner Cartridges Manchester, Buy Ink Cartridges Manchester, Buy Printer Cartridges Manchester, buy toner cartridges Manchester, Canon Printer Cartridges Manchester, Canon Toner Cartridges Manchester, Cartridge Care Manchester, Cheap Ink Cartridges Manchester, cheap ink cartridges uk, Cheap Printer Cartridges Manchester, cheap printer cartridges uk, Cheap Printer Ink Manchester, cheap printer ink online Manchester, cheap printer inks Manchester, cheap toner cartridges Manchester, cheapest printer cartridges Manchester, cheapest printer cartridges uk, Compatible Ink Cartridges Manchester, Compatible Ink Manchester, Compatible Printer Cartridges Manchester, compatible toner cartridges Manchester, compatible toner Manchester, computer supplies Manchester, Dell Printer cartridges Manchester, Dell Toner Cartridges Manchester, discount printer ink Manchester, Epson Printer Cartridges Manchester, Epson Toner Cartridges Manchester, HP Printer Cartridges Manchester, HP Toner Cartridges Manchester, ink and toner Manchester, ink cartridge suppliers uk, Ink Cartridges Manchester, ink for printer Manchester, ink for printers cheap Manchester, ink for printers Manchester, ink printer Manchester, Ink Refills Manchester, Kyocera Printer Cartridges Manchester, Kyocera Toner Cartridges Manchester, Lexmark Printer Cartridges Manchester, Lexmark Toner Cartridges Manchester, Manchester Office Supplies, next day toner cartridges Manchester, office stationery Manchester, office supplies in Manchester, office supplies Manchester, Oki Printer cartridges Manchester, Oki Toner Cartridges Manchester, Printer Cartridges Manchester, printer cartridges uk, printer ink cartridges uk, Printer Ink Manchester, Printer Ink Next Day Delivery Manchester, printer ink online Manchester, printer inks cheap Manchester, printers ink Manchester, printers with cheap ink Manchester, Refill Ink Cartridges Manchester, refill printer cartridges manchester, refill toner cartridges Manchester, same day ink cartridges Manchester, same day printer cartridges Manchester, same day toner cartridges Manchester, Samsung Printer Cartridges Manchester, Samsung Toner Cartridges Manchester, stationery suppliers Manchester, Toner Cartridges Manchester, Toner Refills Manchester, toner suppliers uk, Utax Printer Cartridges Manchester, Utax Toner Cartridges Manchester, where to buy ink cartridges Manchester, where to buy ink Manchester, Xerox Printer cartridges Manchester, Xerox Toner Cartridges Manchester. Bookmark the permalink.